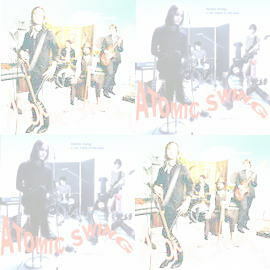 Niclas gave me a tale of Atomic Swing only for this site. This is the story. Four peasants from the northern country came south to look for a piece of land to work. Guided by stars in the sky they all met on golden soil. A soil that hadn't been used in decades and under a quilt of dried grass it laid there so fertile and fresh the peasants hadn't seen anything like it. They put their seeds in the soil. But first season nothing came but a few plants. They continued to work the land but the result was the same. The peasants wondered what was wrong. Had the stars mis-led them? Was their seed of the wrong kind. During the long and harsh winter they started to doubt. Starvation and pilgrimage was now in their minds. Winter was turning to spring and rain and thunderstorms was torturing the land. Water flooded the valley. and the growth of the land was starting in a scale none had ever seen or imagined. The four peasants reaped the harvest and the rumour of the golden soil spread wide around the area. The peasants welcomed the new strangers to see the miracle. Families and strangers where fed. Now people abandoned their lands to have a piece of the golden soil. The land was used and the harvest was growing every year. in the same incredible amount.. Though every spring the golden soil was turning a little bit more grey and dry.. The harvest was smaller and the fruits was less sweet for every year until the plants was pale and fruitless. The four peasants spread in different directions to find new land.